Catalyst Missions is engaging theological famine, spiritual lostness, and human need on four different continents. In August of 2013, Catalyst Missions began sensing God's direction to the South American country of Bolivia. Working through a missionary contact in Santa Cruz, Enoel Suarez, Catalyst Missions took a vision trip in March 2015. With great interest in the leader training we offer, Catalyst went back for the first official training trip in October 2015. Bolivia is a predominantly Spanish speaking country of roughly 11 million people with 39 indigenous languages. While largely Roman Catholic, Bolivia presents a diverse religious scene. The Beni department, consisting of 8 provinces in the northeast corner of the country, is a very poor area but rich in natural beauty and resources. Training of pastors, missionaries, and church planters is the greatest spiritual need in this area. With little access to theological formation, pastors and leaders often face an incredibly difficult task of preaching, teaching, and multiplying the gospel. After our most recent trainings in December 2018, Catalyst has taken further steps to develop and implement a long-term vision to plant training institutes in this country and raise indigenous leaders who will run with these biblical concepts. Needless to say, the training has multiplied rapidly. Now, with training sites in La Paz (San Pedro, Aposento Alto), Santa Cruz, Cochabamba, Guayaramerin, and Buen Destino we have multiple opportunities for churches wishing to partner for the expansion of the gospel through trained pastors, church planters, and leaders. If you love the gospel and beautiful people who are hungry for the Word, come join us for our next training trip, May 2019! Click here for upcoming project dates. Colombia is one of our new locations where we are currently training leaders on the ground and plan to set up residential trainings in 2019. Working through local contacts, Catalyst has established a regional coordinator for pastor training and a regional coordinator for women’s discipleship. Training will be occurring with these leaders throughout 2019 from distance while they multiply in new training sites on the ground in Cudinamarca and Las Amazonas. We anticipate our first residential training as well in July 2019. Click here for upcoming project dates. In January 2015, Catalyst Missions took a vision trip to Southeast Asia to explore a possible relationship with KPACT ministries. This relationship had the prospect of fulfilling a need to train leaders on the Island of Timor near Kupang City. After connecting with local pastors and leaders, Catalyst decided to covenant with them for training. In July 2015, Catalyst took a small team back to West Timor Island to train local leaders in the first module. By God's grace, we continue to see leaders take ownership of their training as the enthusiasm grows with each new week and have graduated our first class in this location in September 2018. Indonesia is a collection of 17,000 islands with an estimated population of 255,000,000 people. The islands have an established presence of Islam consisting of over 87% of the population. The official language is Bahasa Indonesian, but there are many English speakers. Our plan in 2019 is to return to Timor Island to strengthen our graduates with intensive, additional training to aid them in their ministry context. We also, by God’s grace, will open a new site in Central Borneo where we will start with another cohort of pastors and leaders. The need for leader training is great in this dark place, and the work is certainly difficult. Still, the Lord of the harvest is raising up a generation of men and women eager to sacrifice for the gospel mission. Contact us about trips in Spring 2019 to train leaders in Borneo or Soe and use your gifts to spread the good news. Click here for upcoming project dates. The Nigerian project site was established October 2016, and the first training took place June 2017. Our organization is connected with the Kaduna City Central District Church Council of the Evangelical Church Winning All denomination (ECWA). While Kaduna is not the capital of Nigeria it is a large and diverse city, housing nearly 800,000 people and four different ethnicities. ECWA is the dominant denomination, and one that has proven structure and strategy. The first training in June saw over 200 participants during the week. While the strategy isn’t to see how many we can train, the size of this cohort shows the desire and need in this location. They understand the challenge to make disciples of their nation. As part of a church planting network in Kaduna, the leaders we are training present the vision of multi-generational discipleship and church planting. Catalyst is providing training to help move these leaders towards sound doctrine, godly practice, and healthy models of church planting. One man, Victor Suleman, is the church planting strategist for the District Church Council and has 6 young men that are already in the midst of planting churches. We have a round table discussion to hear their needs, struggles, and successes. This group of men understand the need for faithfulness in carrying the mantle of our training into the highways and hedges of a broken world. Our plan for 2019 is to hold two trainings in Kaduna City while starting two other sites through leaders the Lord has raised up in Nasarawa and a location outside Kaduna City. Click here for upcoming project dates. In October 2017, Catalyst Missions began a new project in Central America. The Nicaragua project was birthed out of a need in this central American country for deep gospel roots. 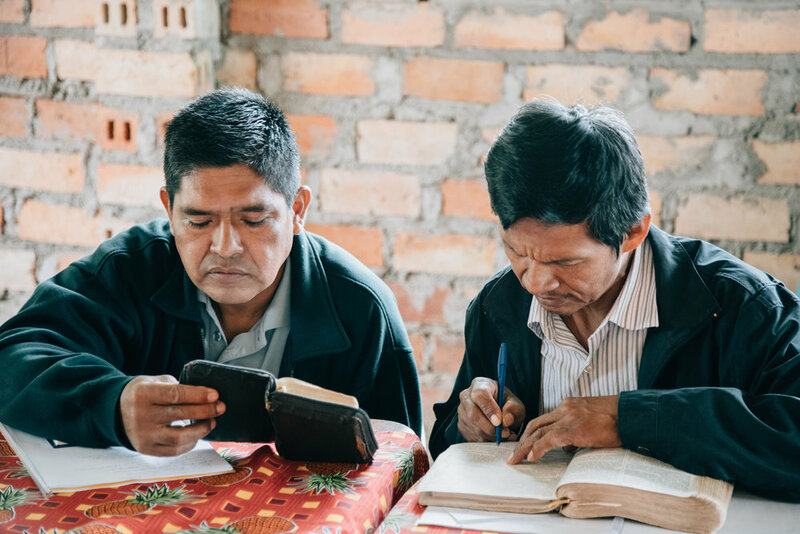 Although the gospel is most certainly present in Nicaragua, the opportunities for theologically and methodologically precise training are scarce. We have been overwhelmed by the thirst for education and the pervasive need for training to help equip pastors and disciples for the establishment of healthy churches and the multiplication of new church plants so that we will “no longer have any room for work in these regions” (Romans 15:23). The project began in June 2017 with training in Juigalpa, Nicaragua. We are already beginning to track a downline of discipleship and a growing number of pastors investing themselves in the training. We believe moving the project to Managua will allow an easier access point and serve as a training and sending ground much like what Paul accomplished with his disciples in the hall of Tyrannus: “(Paul) withdrew from them and took away the disciples, reasoning daily in the school of Tyrannus. This took place for two years, so that all who lived in Asia heard the word of the Lord, both Jews and Greeks” (Acts 19:9-10). In a country of just over 6 million people, the potential for a movement of trained missionaries, pastors, and disciples from Nicaragua to the world is exciting and real. Having established the project, we are now planning for two trainings in 2019 that will bring together leaders from Boaco, Tabasponie, Juigalpa, Masaya, Granada, and Managua. For dates and information on this project, click here. In December 2016, we received a message from a young pastor in the Ivory Coast, James. He wrote the organization to express his need for training in order to complete the ministry the Lord had given him in the city of San Pedro. Because we were not in a position to adopt another new project in 2017, we told James that we could train him using Skype and reevaluate opportunities for residential training in 2018. Since this time, we have been conducting training on a weekly basis with James via Skype and providing instruction on pastoral ministry and harvest church planting. Jesus taught that there are four types of soil, which describe the hearts of all people in the world. The good soil in Matthew 13:18-23 is the soil that produces thirty, sixty, even a hundredfold yield from what was sown and planted. James most certainly describes this good soil. In a recent report, James noted that in the month of July, he had personally witnessed 20 people profess Christ, found 25 houses of peace willing to receive gospel teaching, trained 10 of his disciples in his current church with harvest church planting principles as well as a church in another village, and laid the foundation for a new church plant in a community with no gospel presence. We believe that God has provided a laborer who may be the key to a mighty movement of God in the Ivory Coast. We now have 3 training sites in the Ivory Coast (Yamoussoukro, San Pedro, Djouke) as well as another site in the country of Senegal. Our goal is to continue training these groups in the Ivory Coast in 2019 in order to find more laborers like James who will reproduce themselves unto a great harvest. We are currently planning for our first in-country training for February 2019. For dates and information on this project, click here. We are currently training leaders on the ground in Nepal and the Philippines from distance and researching possible residential trainings. More information soon to come! Part of the vision of Catalyst Missions is utilizing our training to engage ethnic groups in urban areas. Through evangelistic Bible studies, English as a Second Language, Backyard Bible Schools, plant team formation, church planter training, or equipping other churches to begin ethnic ministry, Catalyst has seen the Lord's hand at work. If you or your church would like to get involved, contact us to set up a ministry trip or personal visit!